Never in her wildest dreams could single mom Ella Monroe imagine co-inheriting the small town of Second Chance, Idaho—or falling for its curmudgeonly doctor, Noah Bishop. Despite his rough edges and protests for isolation, Noah has her believing in love at first sight again. But when she’s pressured to sell her stake, Ella is torn between family loyalty and following her heart. I so enjoyed this book! 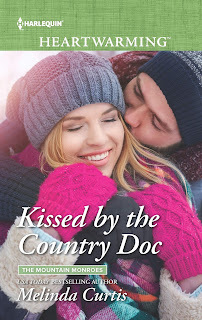 Kissed by the Country Doc launches Melinda Curtis's new The Mountain Monroes contemporary romance series with a fast-paced, delightful story featuring young widow, Ella Monroe and grumpy small-town doc with a secret, Noah Bishop. Both are intriguing, complex characters with whom I felt an almost immediate affinity. I love their banter, they way they challenge one another, and the palpable chemistry they're determined to not acknowledge. Ella's daughter, Penny is a real scene stealer and reminds me a lot of a two-year-old in my own life. I adored her. Another aspect of this story I appreciated is the growth of both Ella and Noah and the fact that Curtis gives them the time to evolve, both individually and as a couple. Curtis populates her small mountain town with numerous characters I'd like to know better. There are the Monroe cousins who arrive with Ella to scope out their unexpected, and unwanted, inheritance from Grandpa Monroe after being cut loose by their fathers: Shane, the former head of Monroe hotels, Sophie, exhausted and overwhelmed single mom of twin boys, and Laurel, former costume designer at Monroe Studios who lives in the shadow of her movie star, identical twin and is keeping a secret from her family. Then there are the residents of Second Chance, Idaho who apparently knew Grandpa Monroe better than his family did. They're none too happy about the Monroe grandchildren descending upon them. They also are keeping secrets and I can't wait to discover more as the series plays out. If you enjoy fast-paced contemporary romance with plenty of emotion, humor, a bit of mystery, snappy dialogue, and heartwarming romance, you'll want to check out Kissed by the Country Doc by Melinda Curtis. It has my enthusiastic recommendation. Do you enjoy small-town romance? Have you read any books by Melinda Curtis? What's the last family series that had you eagerly anticipating all the stories to come? A man in his thirties opened the diner’s door for the carload. He had wavy brown hair in a neatly styled haircut and was inappropriately dressed for the mountains—slacks, leather loafers, a light winter jacket. No cap. No gloves. A case of frostbite in the making. Noah hid a smile behind a sip of his coffee. A woman hurried inside. Bright red hair. Pale complexion. Black leather jacket over a black tunic sweater, black leggings and black boots. Something about her seemed familiar. She spotted the restroom sign and hurried toward it. Whether they were the Monroes or not, they were providing Noah with some much-needed entertainment. Another woman scurried in. She had wavy brown hair, pointy features and frazzled brown eyes shaded by dark circles that her glasses did nothing to conceal. She held the hands of two twin toddler boys, who clumped in wearing matching dark green unzipped jackets and white sneakers that flashed bright red beams from the heels as they walked. She followed the first woman to the restrooms. Single mom in need of a good night’s sleep and proper hydration. A third woman entered, stepping to the side so the man could close the door behind her. Her hair was blond, her eyes a bright blue. She had a sprinkling of freckles and the kind of glowing skin that never tanned. She was the only sensibly dressed one of the lot in a navy stadium jacket, snow boots and a knit cap. The toddler she carried had the same coloring and wore a pink snowsuit. She set down the little girl and proceeded to shed layers—hers and the toddler’s— plopping their gear and a diaper bag in a booth. She wiped the toddler’s runny nose with a crumpled tissue, straightened and took a good look around, while Noah took a good look at her. She didn’t seem like a millionaire. She seemed like the kindhearted girl-next-door. The one who blushed when you asked her to help you with your English homework, and was happy for you when you told her you’d asked the cheerleading captain to prom. Not that I was that guy. She made him feel guilty all the same. Something crashed into Noah’s thigh. The toddler wiped her nose on Noah’s black ski pants and then looked up at him with a mischievous grin and said, “Hi,” before fleeing with a squeal and a giggle across the diner. “Penny.” The girl-next-door snatched a napkin from the holder on the table and wiped at the streak of snot on Noah’s ski pants. And then she froze, her hands inches from Noah’s thigh. Noah’s ears filled with white noise, not caused by any head cold or sinus infection. This was one of those surreal moments where a beauty had unwittingly touched a beast. Noah’s heart went out of rhythm. He felt light-headed. Despite his diagnosis, Noah reached for his dehydrating coffee. But his eyes… His eyes couldn’t turn away from her. Penny’s laughter drowned out the white noise in Noah’s head, and sent others in the room chuckling, breaking the tension that the arrival of the Monroes had caused. Noah breathed easier. “We thought we’d come down and stay a few days,” Shane Monroe was saying, still on his high horse. Not that Noah was one to judge. As an orthopedic surgeon, he’d taken many a ride on a high horse. And look where that’s gotten me. Noah clenched his gloved fists, his left hand more than his right. Penny was playing keep-away-from mama, running on chubby legs between tables in the middle of the room. Not that the girl-next-door was trying hard to catch her. More likely, she was trying to keep Penny from wiping her nose on another unsuspecting Second Chance resident. The toddler boys raced into the dining room and joined Penny. The three of them ran around a table as if they were playing musical chairs or training to be track stars. The girl-next-door and the harried mom of twins moved in. Sensing her freedom was about to end, Penny veered and crashed into Noah, giggling nonstop. She gave a wet snuffle and turned her face to Noah’s knee. She looked up at him, aghast, lower lip trembling. Penny’s mom raised those blue eyes to Noah’s once more, causing a heartstuttering, equilibrium-shaking, whitenoise-in-the-ears relapse. “Given the way my daughter clings to you, we should be on a first-name basis. I’m Ella.” Her glance caught on Noah’s black gloves. And just like that, Noah was reminded why he didn’t want a woman’s interest. “I two,” Penny confirmed, holding up four fingers. The boys stopped struggling and allowed their mother to carry them to the lunch counter, where she deposited each on a stool and ordered French fries from Ivy. “Fesh fies?” Penny toddled forward into Ella’s arms. A fact I noticed completely by accident. I do love small town romance; everyone has everyone's back, just finished Linda Goodnight's The Memory House and an now reading The Inn Keeper's Sister. No, I have not read Melinda's Books. I have looked forward to Roxanne St. Claire's Godfather books, waiting for the next one about the Dad. I enjoy Goodnight's books but it's been awhile since I've read one. I'm loving St. Claire's Dogfather series and am so excited for Daniel's book. Also, very excited that she's continuing the series with stories for the cousins! Good luck in the giveaway. I think you'd enjoy the Monroes. I haven't read Melissa's books but look forward to enjoying them. Small town romance gives me great pleasure since they are meaningful and true. A family series which I read is Caroline Fyffe's McCutcheon series. I haven't read Carolina Fyffe. Thanks for the recommendation. Hi, I am too have enjoyed the Dogfather Series, looking forward to Daniel's story as well. I love small town romance set books, gives me the warm and fuzzies. And no I have not read any of Melissa's books. I've enjoyed the books by Melinda Curtis that I've read. Hope you do too! I have never read Melissa. And love just about any contemp small town series books, Always look forward to Macomber, Mallery, Carr, Virgin River was one of my favorites. Those authors are all favorites of mine too. Melinda Curtis has a good back list. Hope you enjoy her stories as much as I have. I love small town romance stories and I have read Melinda Curtis's books. I enjoy reading Melinda Curtis's book as well as small town romance. I'm looking forward to this series. I love small town romances - I have several series which really fill my heart. Cindy Kirk's Good Hope series is populated by wonderful families and a small town filled with terrific people. I always look forward to the next book in the series. I have Melinda Curtis on my Kindle. Well not actually Melinda Curtis herself but a couple of her books. Small town romances are special since they are old school and have great values. I haven't read Melissa's books. Joann Ross has written such lovely small town romance books. Yes, I love small town romances. I enjoy her stories. I last read The Rancher's Redemption. Maisey Yates Cooper Ridge series featuring the West and Garnett families. I still haven't read any of Melissa's books but several are on my wish list. I loved this excerpt and will be adding this series to my ever growing list. I have read a couple of Melinda's books and enjoyed them. Small town stories are special. The conflicts, issues, characters, relationships, and focus are more concentrated with fewer distractions. The last family series I read was Linda Broday's MEN OF LEGEND series. Though not technically small town romance but historical romance, the size of the community and the concentration of the events in the story are similar.